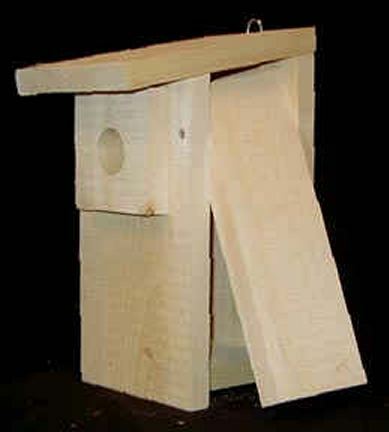 Bird Central - Eastern Bluebird House Kit - Bird House Kits / Birdhouse Kits - various bird house kits, including an eastern bluebird bird house kit and a bat house kit, too! This bird house has a 4 in. x 4 in. floor, which is suitable for a variety of small birds: chickadees, titmice, wrens, warblers, nuthatches and tree swallows. Includes a predator guard that is essential to provide protection for bluebirds. Easy to assemble with instructions and bird information included. NOTE: All of our nesting boxes open up for easy cleaning of the nest box! The clean out panel for this nesting box is on the right hand side when facing the entrance from the outside. It is "hinged" at the top, swings open from the bottom and is held closed by an "L" bracket located at the lower rear of the panel. Hole Size: 1 1/2 in.